QC15 headphones now feature a brand new look—yours. Show off your school colors, team pride or virtually any color combination with your own headphone design, Customized with ColorWare. Choose from 46 brilliant colors to customize 8 separate headphone elements in matte or gloss finish. And rest assured, they’re going to look as good as they sound. Custom QC15 headphones boast a durable finish with a great focus on detail. Superior painting techniques with automotive-grade paint have passed the toughest Bose environmental tests. Customized orders have a different return policy than do standard Bose® product purchases. They ship in 7-10 days after customization and ordering. If you’ve ever wanted to design your own set of sweet, sweet noise canceling Bose cans, have at it! Bose® delivers their best headphones to date. With enhanced noise reducing technology, comfortable ear cups, and crisp, clean sound, the Bose® QuietComfort® 15 headphones live up to their name. Because Bose® brings you exceptional technology, why not collaborate with ColorWare for exceptional customization. Whether you prefer classy, urban or contemporary color combinations, let ColorWare put a stylish spin on your headphones. 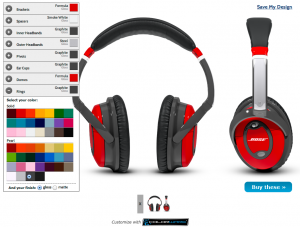 Customize eight separate elements on the Bose® headphones with 46 brilliant colors in the ColorWare color palette. Enjoy your music in style.